Hi, everyone. Nesse episódio do podcast Inglês Online eu vou falar sobre vocabulário em inglês de Twitter e um pouquinho de football. Hey, how’s it going? Today we have a new episode of the inglesonline podcast. Please subscribe to this podcast using the Podcasts app for iPhone or iPad, or listen to the episodes using the Inglesonline Android app. To download or just listen to other episodes and download transcripts, go to inglesonline.com.br and click Podcast Inglesonline. Today our podcast episode will be a little different, just because my inspiration was a hashtag that is currently trending on Twitter. OK. Who has no idea of what I just said? Take a look at the first picture on this episode’s page on the blog. See that phrase in bold, with the hash symbol (#)? That is an example of a hashtag. Let’s say you’re posting something about “apples” to Twitter, and let’s say you put the hash symbol before “apples”. By doing that, you have just created the hashtag #apples on Twitter. If someone sees your Twitter post and clicks on the hasthtag #apples, that will take them to a list of all the tweets containing that same hashtag. Same thing happens on Facebook, by the way. So take a look again at the first picture on this episode’s page. It shows the hashtag #ThingsFootballFansDontSay. I said in the beginning of this episode that this hashtag was trending. What that means is, enough people have posted tweets containing this hashtag… that it has become one of the most popular hashtags on Twitter in that moment. Take a look at the second picture. It says “Trends” at the top. Those were the top ten most popular hashtags in that moment. Those were all the hashtags that were trending in that moment. So you can see that, according to those, no one would say “I’ll just watch for five minutes”, because apparently it is impossible to watch football for just five minutes. Do you agree with that? Are you a fan? If so, which team do you support? Here’s another one that football fans wouldn’t say… in the UK, at least: call it soccer – it sounds better! Yeah, I think the United States is really the only country in the world that calls it soccer – please someone correct me if I’m wrong. Here in the UK, everyone calls the sport football, so you definitely wouldn’t hear people say “Call it soccer”. And there’s another one kinda making fun of England’s performance in general, right? Someone wrote “What a performance by England that was!” So apparently people don’t say that a lot. And, finally, someone contributed this one “That manager seems to know what he’s doing”. Felipão, Parreira, Zagallo, these have all been football team managers. So this seems to be something no football fan says: That manager seems to know what he’s doing. I would think that is mostly true for Brazil as well. You hear a lot of criticism towards managers and not a lot of compliments – unless the team becomes a champion under his management, of course. So I’d like to know your opinions about this topic, especially if you’re the kind that loves soccer, or football! Which team do you support in Brazil? Have you ever watched English football? Do you have a favorite team? I guess some of the most famous ones in the UK are Arsenal, Chelsea, Tottenham Spurs, Manchester United… What else? I don’t know. Let us know in the comments and talk to you next time. after going through some of the posts I realized it’snew too me. Anyways, I’m definitely delighted I stumbled upon it and I’ll be bookmarking it and checking back frequently! I love football.. My team in Brasil is Cruzeiro Esporte Clube and UK Man Untd! I’m Brazilian am i improving my listening with your podcasts. Your work is incredible, you are doing a great job. Keep up a good work.. Thank you so much for help us!! I’m addicted to football, actually I support three teams , first of all Corinthians, but I also like Barcelona and Tottenham. My favorite football is from England, I usually watch every time I can. My dream is going to the stadium and see the teams I’ve mentioned. I’m Henrique, I’m addicted for football, I support SANTOS F.C, I always watch the premier ligue, in the UK I support Liverpool!! Cheers !!!! Great podcast. I believe that team managers are victims of lots of criticism. In england, i like Arsenal although nowadays it is not performing a regular football. All your podcasts are amazing but this one was the best in my opinion. I follow you since I have began to study English. 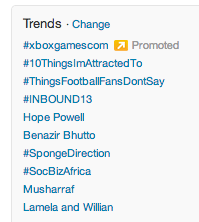 I love football and all these trending topics are true. In Brazil I support to Azulão São Caetano, in fact we are on the Serie B but I am addict by my team, I always go to Anacleto Campanella Stadium and sometimes, if it is possible, I go to stadiums out of São Caetano. My team situation is not good nowadays, I will not say that our manager seems to know what he’s doing. I like English Football but I don’t support to any team. Hey Ana ! How´s it going? I hope you have been a nice work . England is a underfull place. Very good your tip about hashtag. About football all Brazilian is a couch (management) and if the team ins´t winning, the support order: change the couch never the player. I only support the Brazilian selection. Cherrs. The correct word would be coach. Aparently you are already at ease in England, since you asked which team do you support rather than which team do you root for. As for me I am Flamengo in Brazil and Chelsea in England, this later just because our Felipao was its manager or coach, although he didn’t last long in the position. It´s a good article !